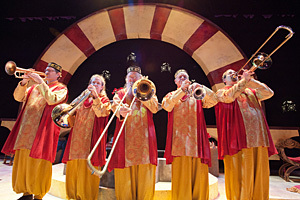 The Washington Revels Brass in roughly its present form joined Washington Revels in 1996. The players had been long-time friends and colleagues, and the Washington Revels organization was the catalyst that fashioned them into a solid entity. The ensemble views itself in a certain sense as a microcosm of Revels everywhere: they have their own rituals, traditions and personality. They differ from every other part of the Revels only in that their ways are largely invisible to all but themselves. The release of their new recording, Remembrance of Things Brassed, celebrates Washington Revels’ thirtieth anniversary and documents some favorite moments in Washington Revels Brass history. In classic Revels style, this musical offering is entirely eclectic and includes music from almost every Christmas Revels show in Washington over the past sixteen years. Many of the pieces will be familiar to even the most casual of Revelers. On the other hand, a few pieces are taken from the most obscure Revels archives. If there is anything that lends unity, it is the irrepressible spirit of joy and celebration that attends the arrival of each successive year’s shortest day.